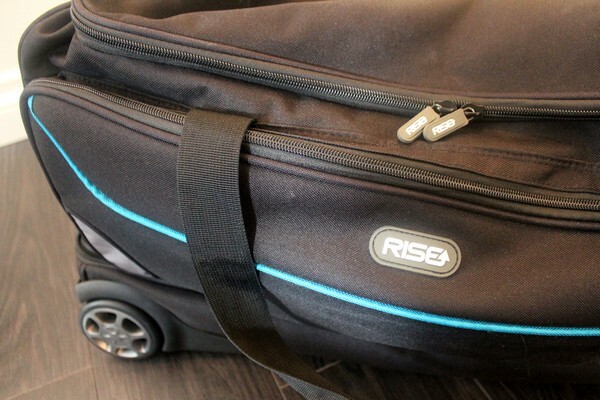 We were recently contacted by Rise Gear to test out its innovative travel bags. We get similar inquiries quite often but typically decline unless we believe it’s a product we’d actually use. This travel bag intrigued us. I thought I had seen the unique bag before, but I couldn’t remember where. Then, after I visited the company website, I remembered seeing this product on the popular Canadian television show Dragons’ Den (here’s the episode). For those of you unfamiliar with Dragons’ Den, it’s similar to the American television show Shark Tank, but it’s the original. We were sent a complimentary Roller travel bag to test out. It’s a revolutionary bag that allows easy access and efficient organization. 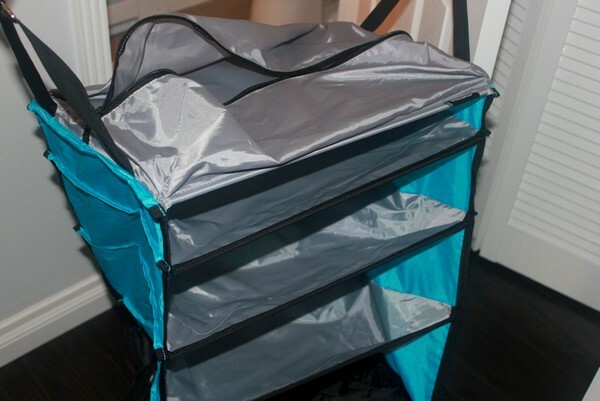 Basically, the bag has collapsible shelving that separates clothing. 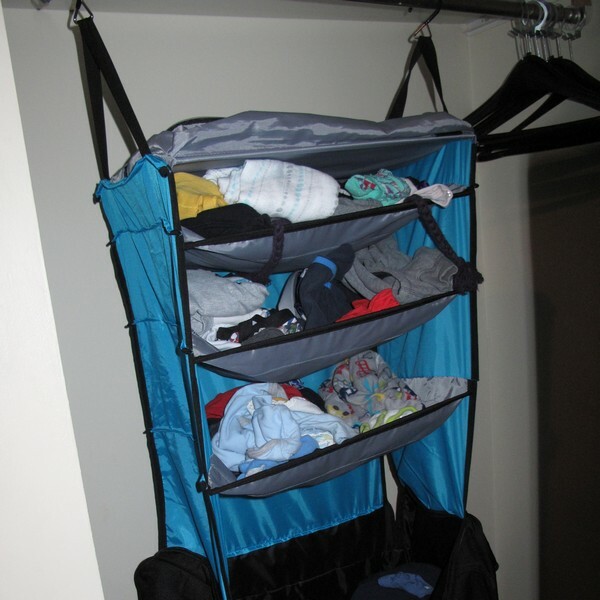 This allows you to organize your items and separate clean clothes from dirty clothes, eliminating the need to shuffle or unpack your clothes. Seriously, how cool is that? We had one of those ‘why didn’t I think of that’ moments. Initially, I wasn’t sure if the bag would work for us. We try to pack as minimally as possible, but with 2 small boys we still travel with a lot of stuff. After testing it on a few weekend trips (2 to 3 nights), I was pleasantly surprised at how much actually fits in this bag. I’ve been able to comfortably fit enough clothes for both boys plus myself (excluding bulky items like diapers and wipes). I appreciate the thought that went into producing this bag. We were sent the largest bag the company offers, but it also has two smaller versions – the Weekender and the Jumper. Easy Access: since the bag folds out to be hung, I don’t need to take half the clothes out of the bag to find what I’m looking for. The ‘shelves’ keep my clothes folded neatly. Simplicity: we arrive at the hotel, unzip the bag, hang it in the closet and we’re done. 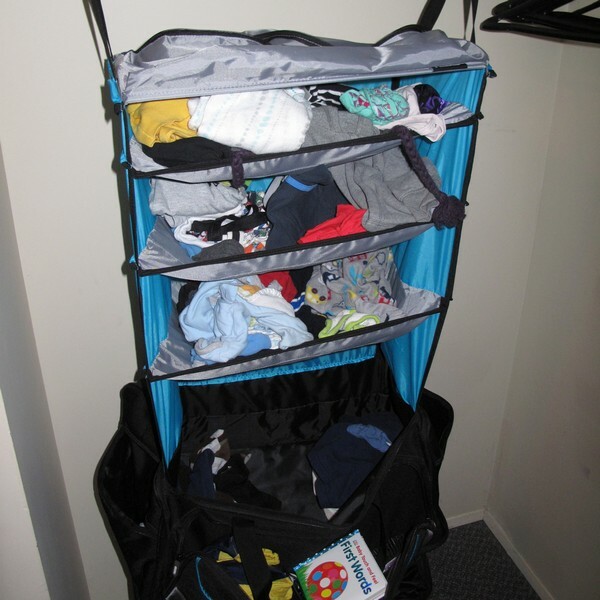 Separate area for dirty laundry: once the bag is hung, there’s a large space in the bottom to put dirty clothes. It keeps the clean clothes separated for the entire trip. When I get home, I put the clean clothes away and easily grab the dirty laundry to be washed. Bottom compartment: on the very bottom of the bag, there’s a handy compartment for shoes or special items. The easy access has come in handy when were on the road or in transit. Useful compartments and locations: at the very top of the bag there’s a small pouch with easy access, I use it for small items and liquids, like Children’s Tylenol and hand baby wipes. Light weight and durable: the bag is the size and weight of a duffle bag, so it’s much smaller than standard luggage. It’s sturdy and durable, with quality craftsmanship. Size: I wish I could use the bag for longer trips! 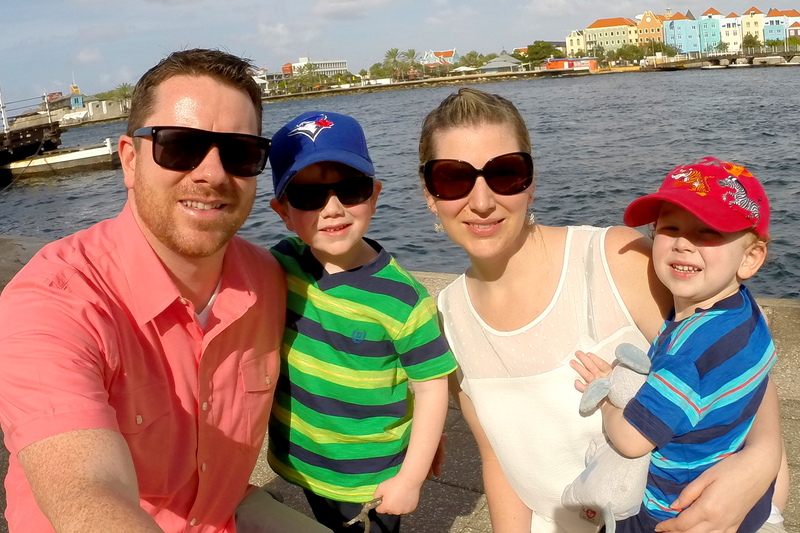 Now that we travel with two little ones, we bring a LOT of stuff with us. Our preference is to limit our gear to two large pieces of luggage. The Roller is a good size for one person, but it’s too small for one adult plus one kid. Soft cover: we have not yet checked this bag for air travel but I worry about items being damaged because of its soft cover. We currently travel with hard cover luggage, which protects our liquids and breakables. I question how well it will protect my items if it’s only half packed. 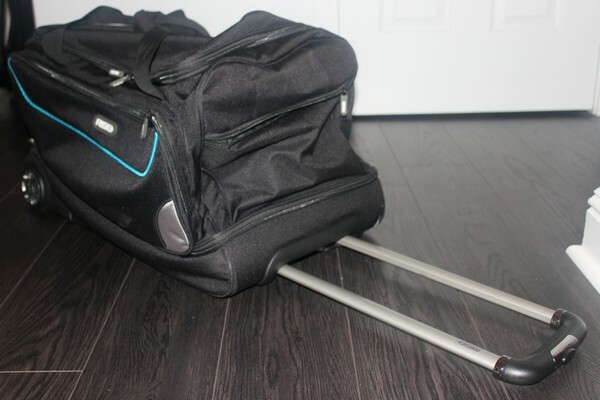 I really like the Roller bag and would recommend it to anyone looking for new luggage. It’s a thoughtful bag that makes traveling super easy and convenient. To learn more, visit Rise Gear or watch the demo on Dragons’ Den. This is beautiful bag, It’s the first convertible I’ve seen that takes full advantage of the carry-on size limits and low profile enough where I feel confident with the style.